This is a photo of toys in the front window of a hobby shop at the San Francisco Japantown Center. 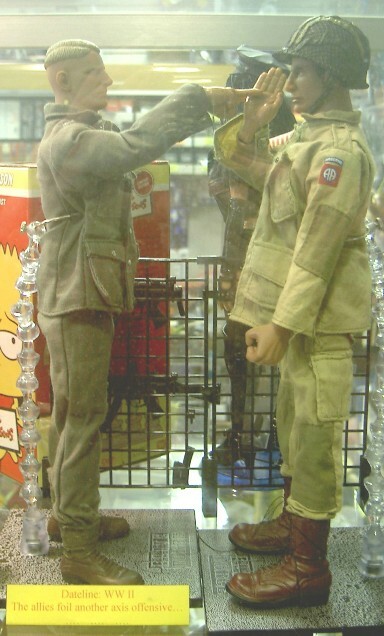 Whoever posed these dolls (sorry, "action figures") obviously watched "The Three Stooges": the American soldier is holding his hand up to block the German's two-finger eye poke. The caption reads: "Dateline WWII: The allies foil another axis offensive." So, if you really want to impress your local sushi chef, say, Agaribana wo kudasai (I'll have some tea, please.). If he gives you a quizzical look (which happens a lot when a Japanese is addressed in Japanese by a foreigner), just say, "Agari" while making a drinking gesture with your hand. Once he gets your meaning, if you want to kid him even more, say, "Tadashii Nihongo deshou?" (That's correct Japanese, right?). Recently in Japan, members of the PTA of a certain school found out that the school cafeteria was using fruits and vegetables shipped in from far away, sometimes even from overseas. These parents called on school officials to use locally grown produce. There are plenty of small farms in the area, they pointed out. Why can't we buy from them? Buying locally was more expensive, but apparently the extra cost was not an insurmountable problem. Students say they like the idea of eating food grown locally, and the family farms that supply the produce say the arrangement makes them feel like they're growing food for their own community. The Mellow Monk online tea shop is back online. We're so sorry for any inconvenience. Not only are we back selling our previous offerings (Monk's Choice and Top Leaf), but we'll soon be adding at least four new types of green teas to our lineup. These include genmai-cha (green tea with roasted whole-grain rice) and houji-cha (roasted green tea with an aroma and flavor that are completely different from ordinary greens).